Not many people are subscription savvy unless and until the product is actually a “need”. Not many people are habitual in gifting people. Not many people are online shopping lovers. And a lot more concerns…. Even though we could clearly see all the challenges on our plate, we studied the US and the UK market and we mapped potential need for India. We also did a small survey and reached out to 1000 quality segmented people and had their feedback before launching our MVP. Before going into details, let me tell you, why did we start Dressprise? We could see people fascinated with fashion and we also could gauge their buying patterns such as season of purchase, the reason of purchase, purchasing patterns (online/offline), purchasing for self or somebody else. We then found the sweet challenging overlap between purchasing for somebody else and the plethora of choices when it came to finally conclude on selection. We picked up this need, worked on this tight and launched Dressprise as a surprise gifting platform. Ideally, our customer persona already had a need of going clueless on gifting their dear ones on certain occasions because they could easily get lost among 10000 products listed on 1000 websites. So we had figured out the need and we had figured out the solution of working as a bridge where we could curate products offline, assemble them in a box and ask the users to choose the particular box for their dear ones. Can you sell something, which people can’t see at first? We did! How to gain the trust of people to pay for something, which they can’t see at first? We did social media search for people who had their upcoming birthdays. Then we gauged their very dear ones and told them about Dressprise and how wonderful would it be if they could surprise their dear ones (even if they were not thinking before). To our much surprise, we are profitable from our first transaction itself. People started responding because they knew me personally and they had a level of trust with me. They thought to give it a try and placed orders online. Since it was a prepaid payment model, so we used to get the advance payment. Once that was done, we used to understand the receiver and occasion persona and curate the products accordingly. We used an offline hack to make sure the receivers are bringing excitement to digital media as well. 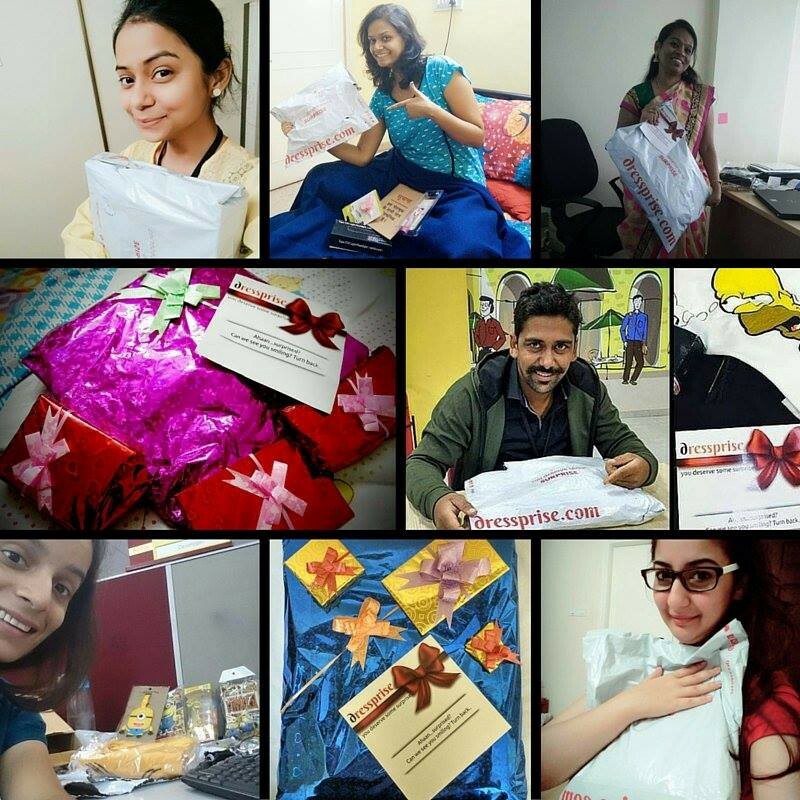 We send them a personalized card where we ask them to upload their smiling faces holding the box and upload on their social networks. So we gained our first customer as a micro-influencer. Much of the word of mouth started working because they were genuinely happy with the surprise experience overall. Soon our first set of initial customers became repeat customers. Dressprise started expanding its roots and started developing its branches. For the first 3 months, our average order value had been 1000 INR/ user/month. We were clocking in about 12000 INR per month with 12 customers on the plate (all organic). We could see people had started paying money and had started speaking of Dressprise without even asking them to do. Now we had to scale our numbers. We were active on social media such as Facebook and Instagram but since we were bootstrapping (now we’re looking for funding to scale up more), we had to be on the shoestring budget. We did our research on influencer marketing and thought of investing our time over the same. But influencer marketing comes with its own challenges for a very early stage non-funded startup like us. As a follower of lean startup methodology, we started focusing what we had at the moment. We had an MVP ready, we had our first set of customers, we had good transaction made online to validate our need, and we had “Happy Customers”. Among all these, we tapped into our “Happy Customers”. Almost all of them were active on Facebook and Instagram. Since they were already happy with the experience, it was not difficult for us to ask them to mention about us in their daily feeds. 12 customers with each having an average of 500 Facebook friends and average of 300 Instagram followers doubled our AOV. We asked them to focus on high margin boxes worth INR 2500 (as compared to INR 1000 before) and they resulted in bringing one more customer per head. The sweetest result has been the surprise experience is itself retaining the customer base. So with the minimal marketing budget and excellent surprise experience, we were able to double our AOV using our first set of customers as micro-influencers. We will still be continuing with micro-influencers only because they bring quality viewers and that often lead to higher conversion. Going ahead, we will be tapping into incentive-based marketing and as soon as we will have our results, we will share our learning. If you have scaled up using micro-influencers, please share your learning in the comments. Also, you can share this among your network to tap into the marketing potential.